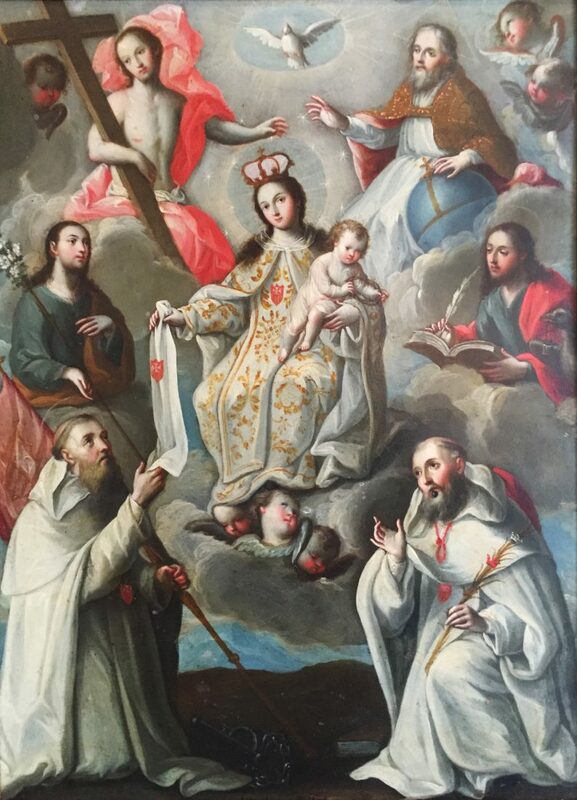 This painting celebrates the foundation of the Royal, Celestial and Military Order of Our Lady of Mercy and the Redemption of the Captives (Latin: Ordo Beatae Mariae de Mercede Redemptionis Captivorum, abbreviated O. de M.), also known as the Mercedarians. It ws founded by Saint Peter Nolasco in Barcelona in 1218. It is a mnedicant order founded for the purpose of ransoming impoverished captive Christians (slaves) held in Muslim hands, especially along the frontier that the Crown of Aragon shared with al-Andalus (Muslim Spain). The fine oil on copper depicts the central figure of the Virgen de la Merced, or the Blessed Virgin Mary of Mercy, holding the infant Jesus. The Trinity can be seen above her, Jesus holding the cross on the left, God the Father holding the globus cruciger on the right, and the Holy Sprit at the center. She is flanked by Joseph and John the Evangelist. She wears a gold-embroidered garment bearing the symbol of the Mercedarian Order, and she gives a cloth bearing the symbol to Peter Nolasco. Angels and cherubs complete the scene.